“Featured Artist of the Month” in Port Townsend! “After the Shower” Watercolor. Frame size: 29″ x 23″. Come to Port Townsend in June! I’m the featured artist of the month at the Northwind Art Center, displaying 5 of my Floralscape paintings bathing the prominent wall with luminous colors and the sensuality of magnificent blooms up close and personal. My art shows in a space with the 35 NW artists’ works, all who were also juried into the gallery for this year by Ned Mueller. (The shows change monthly and the wide variety of art offers something for everyone). I’m especially honored to be featured for the month of June when Port Townsend will be enjoying its lively season and while the whole Northwest is still in high bloom as new breath-taking life springs forth. The town really turns out for the Art Walks on the first Saturday of the month. It’s fun and friendly. I’ll be there Saturday June 2 from 5:30 – 8pm for the reception and look forward to seeing YOU there! If you can’t make it that date, there’s lots going on in the area all month to enjoy along with your gallery visit. I love Port Townsend in the springtime! This show runs from May 31 – June 30, Wednesday – Monday, 11:30am-5:30pm. Closed Tuesdays! Besides “After the Shower”, the ‘white’ dahlia shown above, I’ll be showing the small hydrangea painting, “Ice Queen” shown below. Also 2 large paintings, “Dahlia Darling” & “Angel’s Pirouette“, and the rich magenta piece, “Orchidaceous.” It’s a good chance to get lost in the beauty of a flower. Every month for the rest of 2018 all the artists will be showing 3 new works at a time to keep you coming back. I plan to be at each First Saturday Art Walk. Mark your calendars! 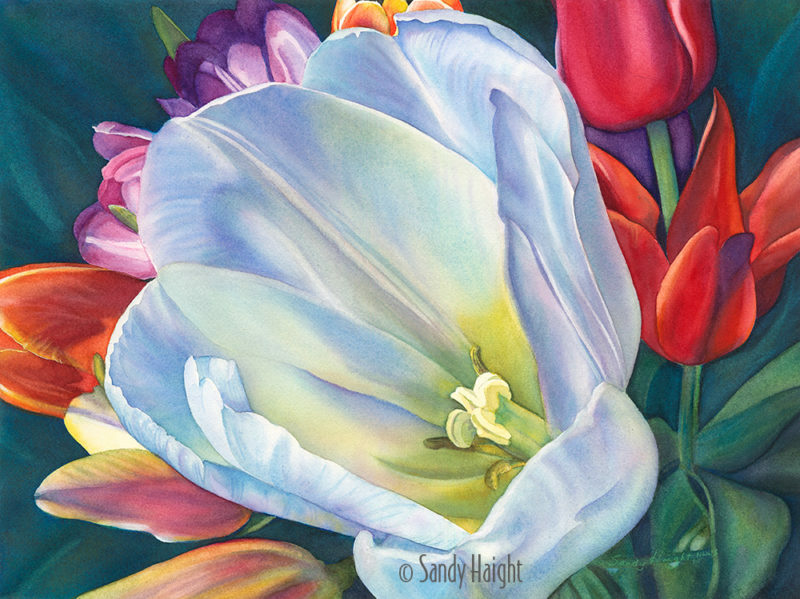 As the artist for the 2016 Tulip Festival poster, I’ll be exhibiting 10 of my Floralscape paintings at the Scott Milo Gallery featuring Skagit Valley Tulip Festival Poster Artists Past & Present for its April show. After visiting the world famous tulip fields, come see this big glowing painting of a trumpet flower from an unusual point of view as it unfolds beneath a blue sky. 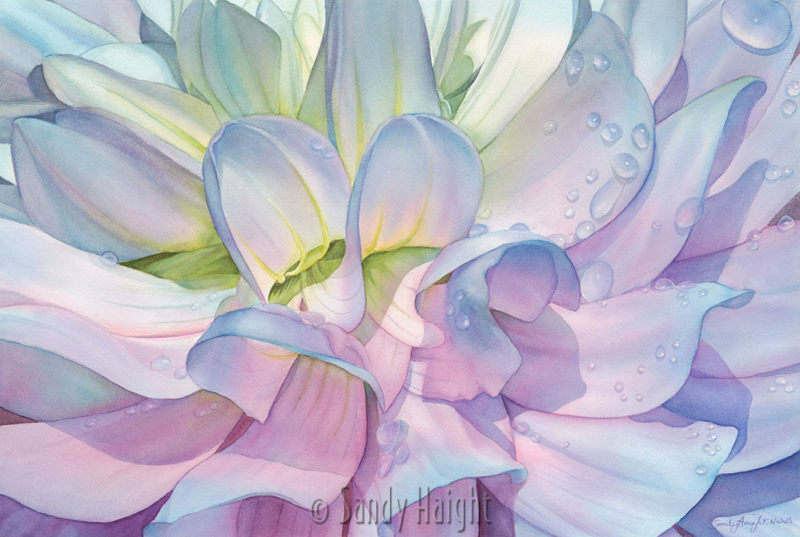 The show features oils by 2018 poster artist, Melissa Jander; watercolors by 2016 artist, Sandy Haight; still life photographs by 2000 & 2003 poster artist, Randy Dana; and pastels by 2015 poster artist, Teresa Saia. Also showing are quilts by Fidalgo Island Quilters. Official Skagit Valley Tulip Festival merchandise is available. Join me at the opening reception Friday, April 6 6-9pm. Show ends May 1. 10:30 am – 4:30 pm and by appointment. Closed Sundays. 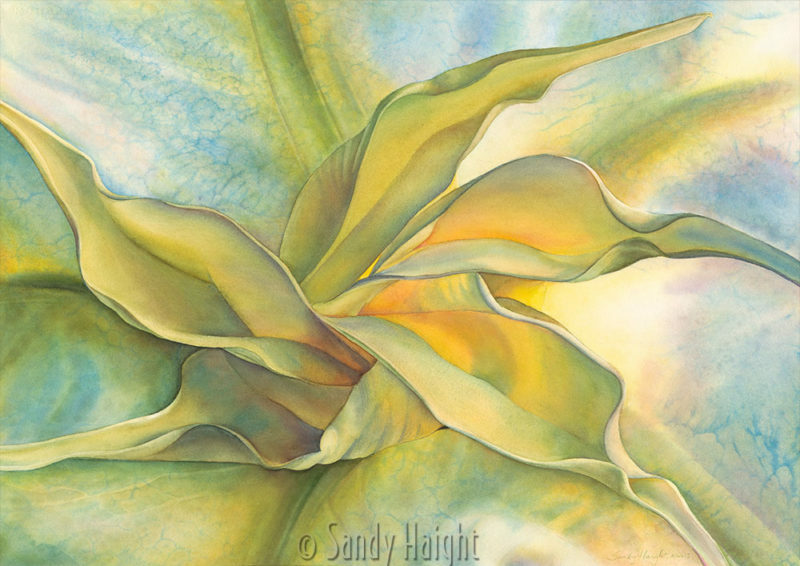 Sunshine Dance by Sandy Haight. Watercolor. Image size: 13″ x 10″ in 20″ x 16″ frame. Hop on over to Port Townsend the next day and join me for Saturday’s Art Walk and my next reception at the Artist’s Showcase in the Northwind Arts Center. I’ll have 2 or 3 paintings on display at a time, changing monthly, through the end of the year. My work will be in the company of 35 other artists! 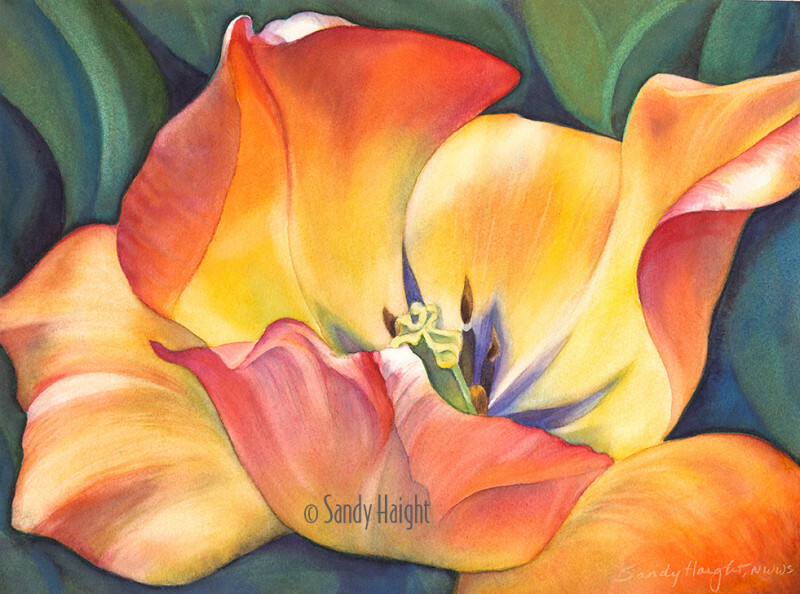 This small painting of an opening tulip will welcome you with a dance to the tulip season and the flowering of spring! Opening Reception: April 7, 2018 5:30 – 8:00pm. 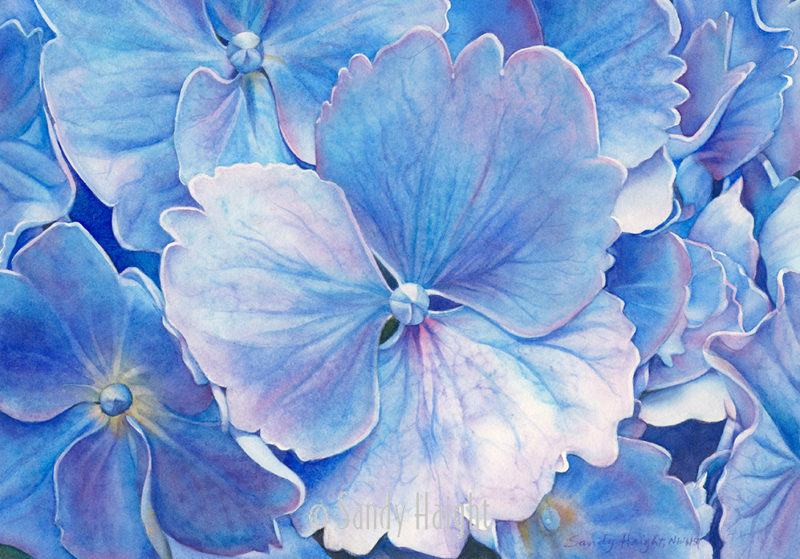 LuminEssence by Sandy Haight. Watercolor 19″ x 14″ in 26″ x 21″ frame. Just in time for the spring bloom I was juried to be one of 35 artists selected for The 2018 Artist Showcase in Port Townsend, WA. The juror this year was Master Artist Ned Mueller. Northwind Arts Center which hosts the Artist Showcase, is in the heart of charming Water Street. It provides a professional juried exhibit space in which the artworks are presented in a curated show that is changed monthly. For 9 months I’ll be showing 2 or 3 paintings at a time starting March 1. Receptions are the first Saturday of each month during the Art Walk from 5:30- 8:30pm. Check out the wide range of artists that will also be showing with me this year here. Group shows are really fun. I’m looking forward to many visits to one of my favorite NW towns! I’ll be the featured artist for the month of June with space for additional paintings! I’ll send you a notice before that June 2 reception. Happy flowering spring! It’s coming…. It’s a big welcome to my new home in Kitsap County to be accepted into the Washington State Juried Art Competition which opens Saturday, January 20, 2018 at Collective Visions Gallery in Bremerton. 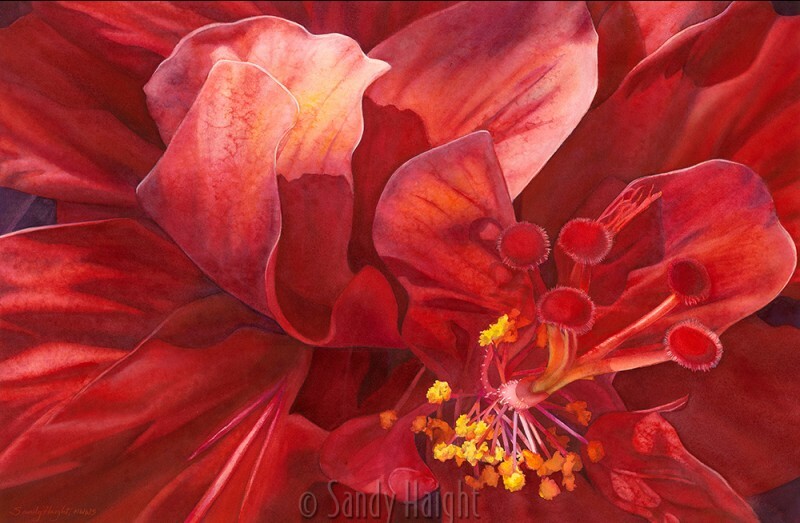 One of my favorite Floralscape paintings, Kilauea’s Kiss seen here, was selected for this show (click here for a previous post about the unique painting process for this watercolor of a luscious Hawaiian double hibiscus bloom). The annual CVG Show is one of the largest and most prestigious art competitions in the Northwest. 283 artists throughout Washington submitted over 900 images for consideration. The competition’s three jurors, Paula Stokes, Teresa Saia, and Harry Longstreet, chose 125 pieces from these submissions for inclusion in the show. Categories include 2D, 3D and Photo/Digital. I’m honored and looking forward to being a part of this exhibit right in Kitsap County…and it’s easy by ferry from Seattle! CVG Show: Saturday Jan 20, 2018 until Saturday, Feb. 24, 2018. Gallery hours: Tuesday – Saturday 11 to 6. Special opening: Sunday, January 21, from 12 – 4 pm for viewing the artwork and to hear discussions by Teresa Saia and 2 gallery artists. Art Walk: February 2, a fun time to see the show! Accepted artists & artwork list: visit www.CVGShow.com.